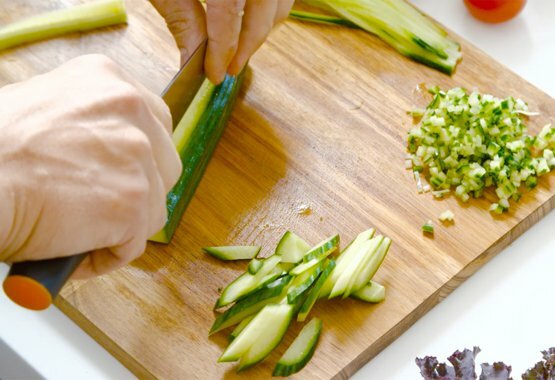 There’s a good reason why culinary school begins with lessons in knife skills. 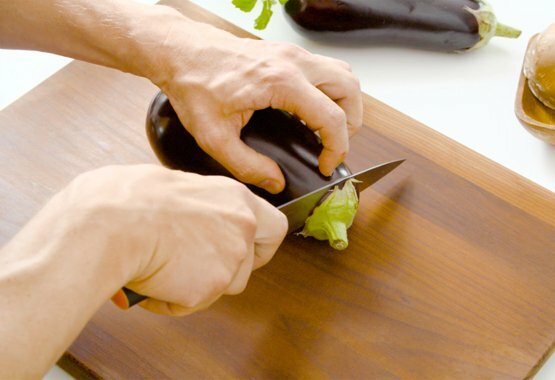 Mastering cutting techniques is an essential part of any cook’s repertoire in the same way as good knives are the basis of a well-equipped kitchen. It’s never too late to learn! Our Cutting Academy will teach you how to slice, dice and chop like a pro and choose the right knife for each task. 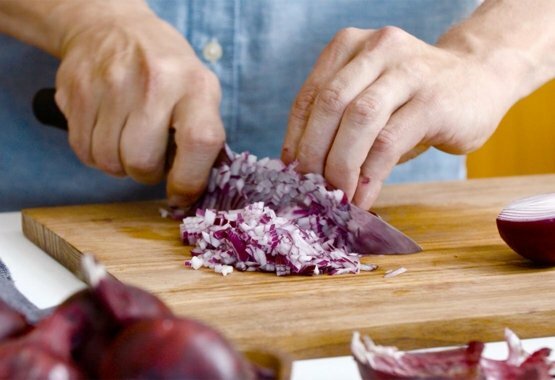 Diced onion is the basis of many dishes, so learning the proper onion cutting technique is definitely worthwhile. 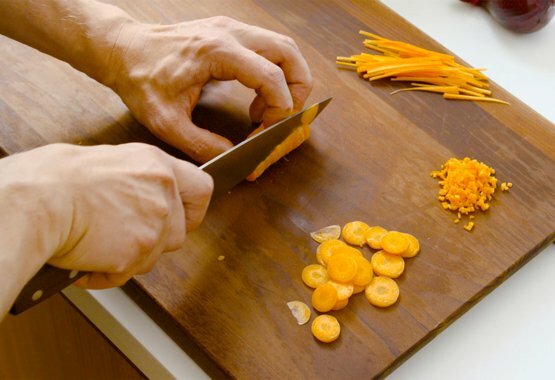 The secret is to combine vertical and horizontal cuts – and to use a sharp knife to prevent tears! Julienne, Macedoine, Brunoise, Paysenne and Mirepoix – these classic cutting styles will transform your carrots into uniform pieces and beautiful dishes. Most people always cut cucumber the same way. Bring variety to your salad with four new ways of cutting. A good cook’s knife is an essential and versatile companion in the kitchen. Combined with a few simple cutting techniques, you’ll be ready to handle a wide range of shapes, sizes and textures. 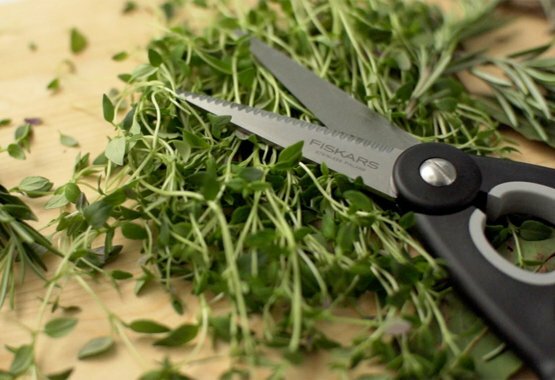 For very finely cut basil, start by rolling the leaves like a cigar, then slice into thin ribbons using a sharp knife. 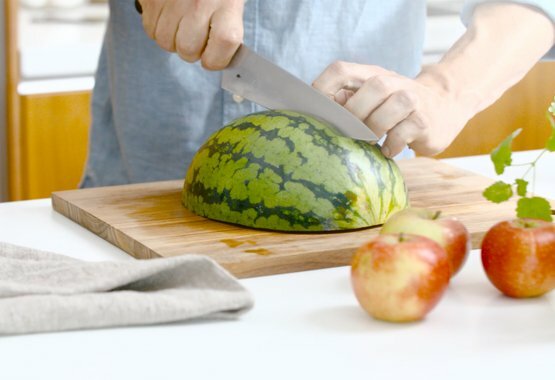 Watermelon is often cut into triangles or half circles, but did you know there’s another way to quickly cut it into bite-sized portions? The thick shell is easiest to cut with a heavy-duty knife, like a Large Cook’s knife. The flexible and slim blade of the filleting knife makes it perfect to fillet fish with. 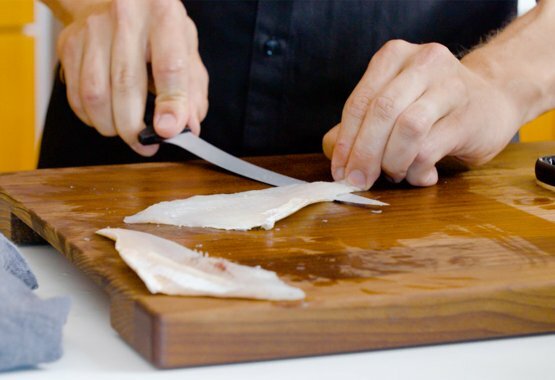 To remove fins and cut the fish open easily, use fish shears. Peeling can be tedious with the wrong tools and lead you to throw away plenty of perfectly good food, so it’s worth investing in a peeler and some good peeling knives. 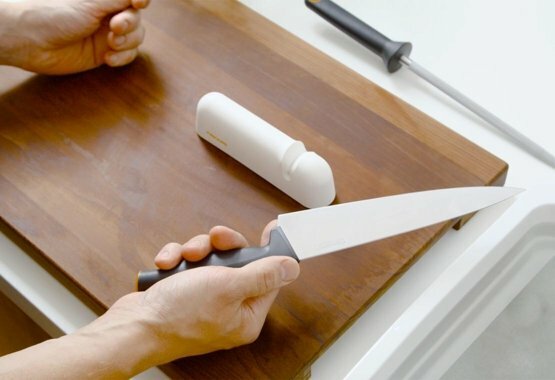 When sharpening a Fiskars knife using a sharpening stone or a sharpening steel, alternate the knife from side to side while maintaining a 15 degree angle. With a roll-sharp, just push the blade through 15-20 times in both directions. 1. The carving knife's blade is slim with a pointed tip for carving roasts or slicing salami. 2. The bread knife slices cleanly through hard bread crusts thanks to its long and strong serrated blade. 3. The cook's knife is the quintessential knife of passionate chefs, with a broad blade and fine cutting edge for chopping, cutting and slicing meat and vegetables. Comes in several sizes. 4. The serrated blade of the tomato knife makes for easy cutting of tomatoes and other thin-skinned fruit and vegetables. 5. The paring knife is small with a slim blade for peeling, cutting and slicing fruit and vegetables. 6. The peeling knife is perfect for cleaning, peeling and cutting smaller fruit and vegetables. It’s important to sharpen your knives regularly. Fiskars tools for sharpening include a sharpening steel and the functional Fiskars Roll-Sharp sharpener, both of which can be used even for knives with serrated blades. See the video tutorial on this page for a demonstration of how they are used. 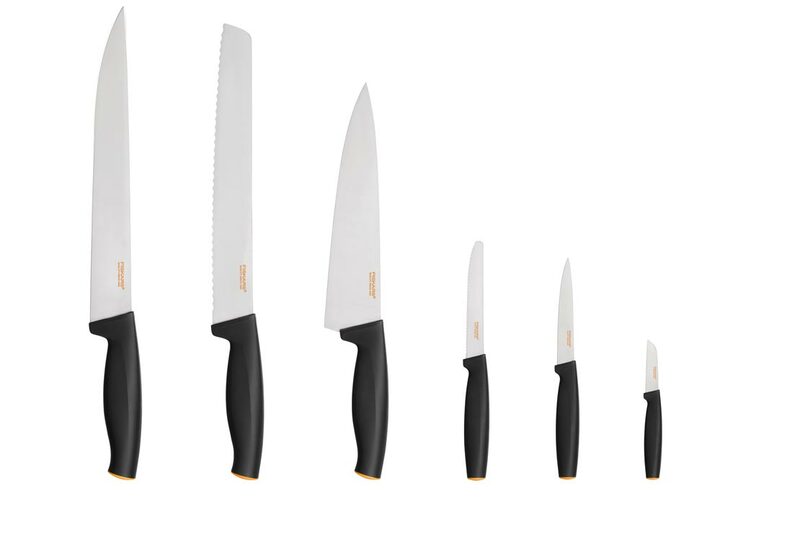 When stored in knife blocks or racks to protect the blades, your Fiskars knives will keep their sharpness even longer. 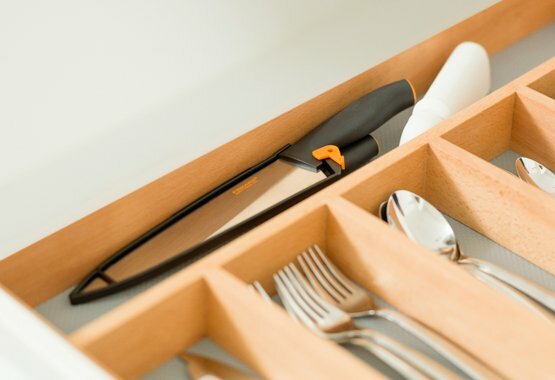 Fiskars knife blocks and knife magnets provide convenient storing with a perfectly balanced look and feel. Before storing your knives, it’s important to wash and dry them – ideally immediately after use. To wash knives in the dishwasher, make sure to use a blade protector. For any more information about choosing and caring for your Fiskars knives, please ask at your local store, see the Cutlery product page on our website or contact Customer Care. Sure, knives are great for many cutting tasks, but sometimes snipping is the way to go. 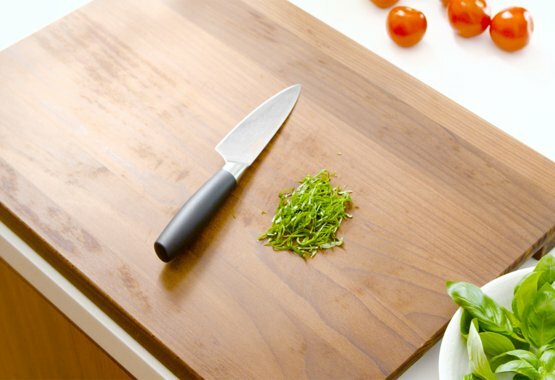 Scissors are a convenient option for cutting herbs, snipping fish fins, cutting poultry, or whenever a cutting board feels unnecessary. Just like knives, scissors come equipped with different types of blades. Non-serrated blades ensure high-precision cutting. Serrated blades help keep slippery ingredients and materials in place while cutting. Take good care of your scissors to ensure an optimal performance. Wipe the blades after each use to keep them clean, and oil the pivot area once in a while to keep the cutting motion smooth. If the blades get dull, you can use a Fiskars Scissor Sharpener to sharpen them.